There is still one more day left of the 2016 Night It Up Asian night market in Unionville (Markham), Ontario. I’ve been to most of the Asian food festivals across the GTA and Night It Up is, in my opinion, hands down the best of them all! The vendors seemed especially good this year. Below you’ll see what we ate, what we saw, what Really excited us, and some of the better deals that we found! Night It Up is an annual Asian food night market that takes place in Unionville (Markham), Ontario. It has free admission, runs for three days over a weekend, and has over 100 participating vendors. Most of the vendors sell food and showcase dishes from various cultures, including Chinese (Hong Kong, China), Taiwanese, Japanese, Korean, Malaysian, Filipino, Hawaiian, and North American. Other vendors hand out free samples, offer services, host games, and sell toys, gadgets, and even live gold fish, etc. There is also a ton of entertainment, including live music, dance performances, sports tournaments, and free outdoor Chinese movies. There are a few vendors that participate in Night It Up every year. The regulars sell charcoal grilled skewers, (lamb being the most popular), grilled whole squid, fresh fruit juices (pineapple, watermelon, and coconut served in the fruit rind), tornado potatoes on a stick, takoyaki (Japanese deep fried octopus balls), oyster omelettes, corn on the cob, and stinky tofu (Mother Bear’s Smelly Tofu gave me food poisoning a few years ago, by the way), etc. Although most of the vendors are from smaller, less-known restaurants, you’ll notice some larger chains as well, especially when it comes to the bubble tea vendors. In terms of freebies, this year we noticed Aveeno (a newer regular), Trojan (a long-standing participant), and Royale Tiger paper towels. Personally, I prefer my egg waffles plain, so I wasn’t compelled to try this. See below for more details on poke and the two vendors that were at the food festival. Wabi Sabi Musubis sold the Hawaiian classic, spam musubi, which looks like a giant piece of sushi with a slice of spam on top of a block of rice, held together with a thin piece of seaweed. I tried the Taiwanese fried chicken pieces. I thought it was quite expensive, at $9 for 2 pieces of chicken (one drumstick and one breast). I purchased it anyways, because I had never seen something deep fried so beautifully at a food festival before. It did not disappoint. The chicken pieces were very large and they were cooked well (not dry or overcooked). The batter was nice and crunchy without being hard, but it tasted a bit too greasy to me. It was like I could taste the old oil that was used in the fryer. I still highly recommend it though, because the sauce was surprising and absolutely delicious! I don’t even know how to describe the flavours. The red colour is deceiving; it’s not spicy at all. I really wish they had put more of the sauce on the chicken. That’s coming from someone that doesn’t typically like sauces and usually asks for no sauce or sauce on the side! BUY THESE!!! 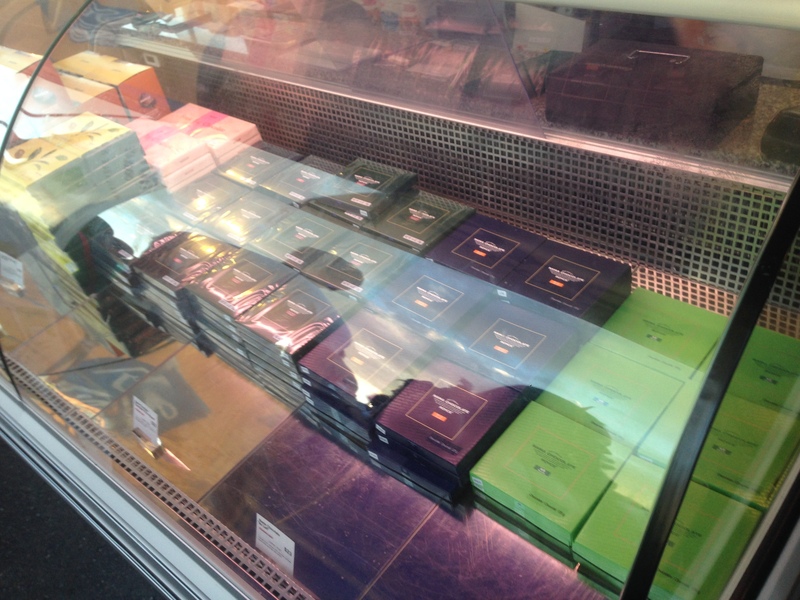 Royce Chocolates are made in Hokkaido, Japan and are internationally known. The only current Canadian location is in Vancouver. I tried to buy these from last week’s Japanese Festival in Mississauga, but they were all sold out! I bought the maccha white chocolate and will be returning tomorrow to buy more! Depending on the flavour, one box of 24 pieces will cost up to $26 (including tax), but believe me when I say that it’s worth every penny and much much more. They even wrapped the box of chocolates with a small ice pack to keep them fresh. I plan on writing a separate review on Royce Chocolates, so keep your eyes open for that along with some exciting news for Toronto!!! 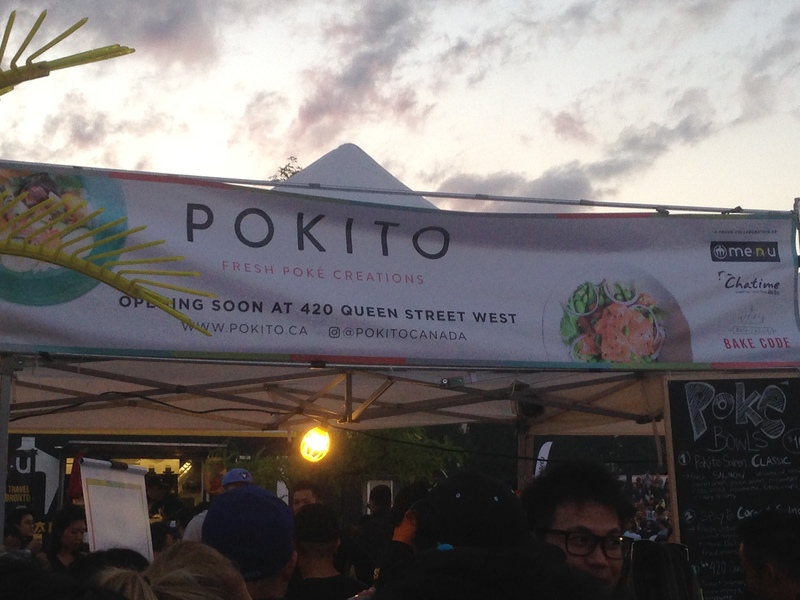 Pokito will be opening on Queen Street West in August. Their menu sounded better and more authentic to me than their competitor, Poke Wrap (which will open around Yonge and Dundas in September). We tried the salmon classic from Pokito. For $10, you get a very small portion of fish, but it was served atop many other ingredients and rice. My only critique was that the fish was under-seasoned. The menu options from Poke Wrap were only $6 each. Salmon classic poke bowl from Pokito. The colourful candy coated popcorn is literally frozen using liquid nitrogen. The vendor said that you can feel the cold all the way up into your nose. This looked like it was fun to eat, with the “smoke” escaping your mouth as you eat it. They were selling these at $5 for a small cup and $8 for a large cup. I was excited to see soft shell crab at the festival, but the batter looked too heavy and soggy, so I didn’t end up trying them. They were selling for $13. 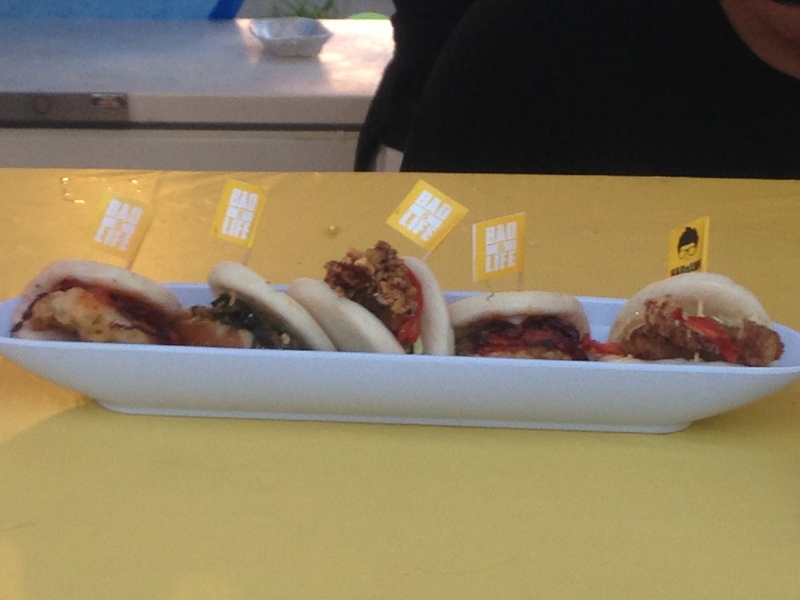 I actually went looking for Bao is Life at the night market, because they sell fusion Chinese-style, open faced buns. I first fell in love with this type of bun at Ippudo in NYC (see my review here). Years later, I started noticing them all over Toronto, including Momofuku Noodle Bar (see my review here). So I was very curious about Bao is Life. However, I’m very picky when it comes to fusion, and I didn’t love the options that I saw at their stand. They are selling for $5 for one or $8 for two. If you tried them, please let me know what you think! Noodles are always available at Night It Up and a few years ago, a vendor started selling ramen burgers, where meat options are sandwiched between two patties made from ramen noodles. 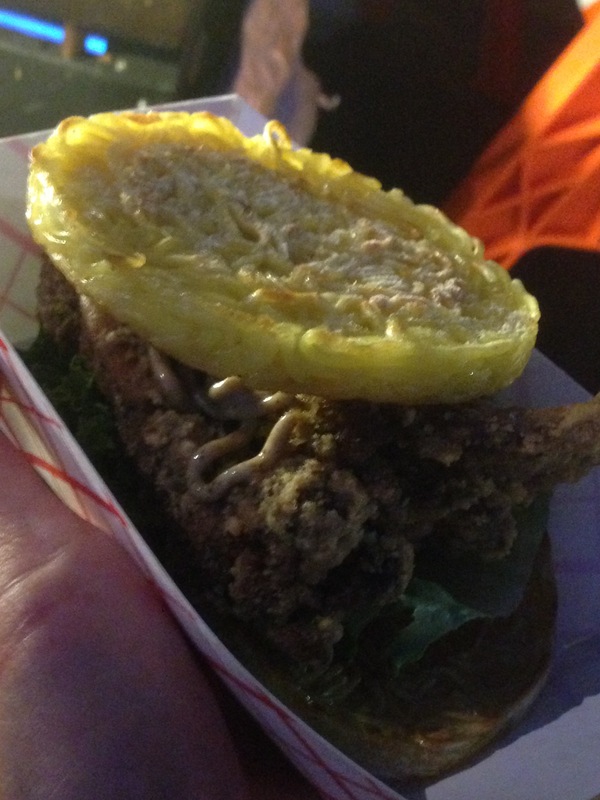 I was always skeptical of how good their ramen burgers could be, but finally caved and tried one this year! I wanted to order the pork belly ramen burger ($10), but they were sold out and the vendors actually said that they liked the fried chicken ramen burgers more ($9), so we got one of those. 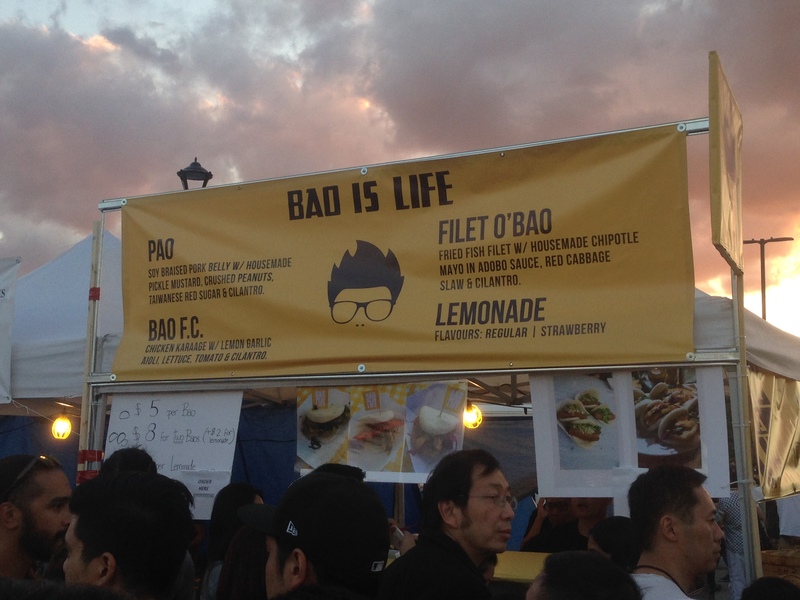 Although it was probably one of the best valued dishes at the festival ($9 for decent sized protein and two ramen or rice patties), I was disappointed. The noodle patties were cooked on a flat top griddle, but weren’t nearly crunchy enough on the outside to compliment the soft and chewy ramen noodles. The deep fried chicken was crunchy, and I really liked the uniquely flavoured sauce and batter, but the chicken was overcooked, tough and stringy. 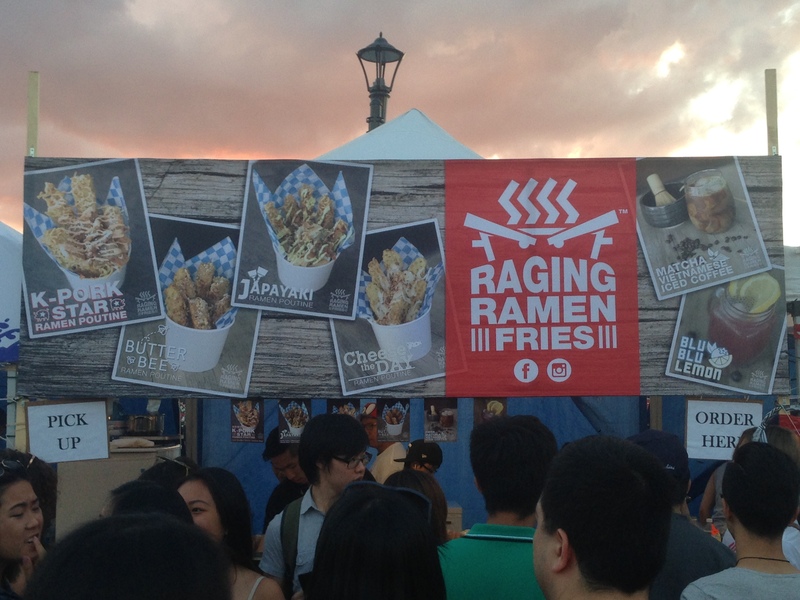 This year, I noticed a vendor selling ramen fries. The concept sounded great to me, ramen blocks that have been deep fried, cut into sticks, and then topped with various sauces and additions. However, they looked overly fried and cost $10 per order! So, I passed on the ramen fries. If you tried them, I’d love to hear what you thought of them! I’ve noticed that overall, the portion sizes are getting smaller and the prices are approaching unreasonable. For example, in the first few years of the Night It Up festival, I always bought a fresh fruit drink! They were delicious, refreshing, and fun to drink. But this year, one pineapple drink cost $10! So I’ve shared a few good deals that I noticed. You might want to keep your eyes open for these tomorrow. Also, if you go on the last night of the festival, closer to the end of it, you’ll notice some vendors reduce their prices. Real Tropical Juice Store was offering free refills on their fresh fruit drink! Although I don’t know how much they’re charging for one. As I mentioned earlier, Ramen & Rice Burgers were an excellent value. For $9 you get a dish that is quite filling – either pork belly, deep fried chicken, or a large burger patty sandwiched between two rice or ramen patties. The flavours were great, but the execution of my order wasn’t (see above for details). Charcoal grilled skewers are probably the most popular item at most Asian food festivals. In previous years, there seemed to be more selection, including various gizzards on sticks. This year, the most widely offered skewers were lamb. (I’ll post my Chinese lamb skewer recipe later this year.) If you’re looking for affordable lamb skewers, Yizhi BBQ had the lowest priced lamb skewers from what I could tell. They were selling 4 for $5 or 9 for $10. The vendor shown in the photo below was selling fish balls, beef balls, squid, and various vegetarian skewers at a very reasonable price of $5 for 3 skewers. Beware, they were quite spicy. Also, the squid was overcooked and rubbery. Note that these skewers were half eaten before I took the photo. Thank you for posting about us on your blog! We are announcing our location on our social media on Monday July 22!